Wanting to upgrade your image, then why not have a "Groovy" Head Cover in your bag. Majority are magnetic and with a wide range of colours, designs and sizes they will fit any putter. Zach Johnson uses the Red Tartan head cover on his PTM SeeMore Putter. See the full range on our shop web page. Postage and packing in the UK only £4.50 and Head cover £22.99 so for less than £30 you can give your bag a lift. 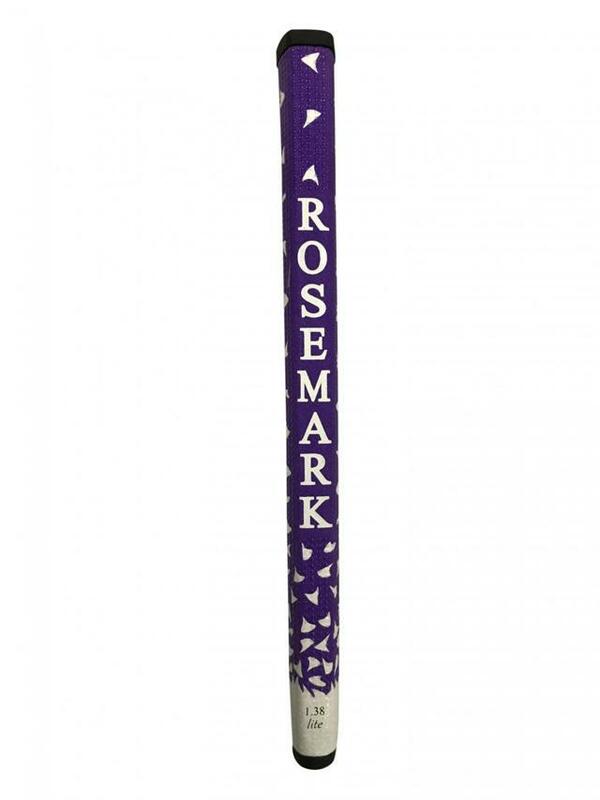 The Rosemark Grip could be the most simple thing to transform your putting. Shaped to fit to the shape of your hand and in three different sizes, this grip is designed to take the tension out of your hands, wrists and forearms. The new 1.38 is being used by Sir Nick Faldo on his Si5 SeeMore putter, but this grip can be put on any putter. Check out our website at http://seemoreputters.co.uk/shop to see the full range of sizes, colours and lengths. A demo day is in the diary at Hinckley Golf Club for 7th April - 10.30 to 3pm. Contact the Pro Shop for info. A demo day is in the diary at Royal Cinque Ports Golf Club for 3-5 April in conjunction with Howerd Hewitt Tournament. Contact the Pro Shop for info. A demo day is in the diary at The Manor Golf Club for 14th April - 10.30 to 3pm. Contact the Pro Shop for info. Delivered the SeeMore Putter SPI Pack to Sutton Coldfield Golf Club at 12 noon on 23 February 2018 and by 3pm first order was placed for a custom fit and build putter. With the putter being about 40% of your game having a fitting and then a club built to suit your needs you should see the handicap impact in the right direction. In common with many clubs founded in England in the late Victorian period, Sutton Coldfield Golf Club boasted a clergyman of the Established Church, the Reverend Canon WCR Bedford, as one of its founders and a drawing of him hangs prominently in the main room of the Club to this day. The Club was founded in 1889 and at first played as a nine hole course laid out at the Town Gate of Sutton Park. The Park comprising 2,400 acres, was originally part of the Great Chase of Cannock, but by the sixteenth century the encroachment of farmland had seperated it from the Chase. This seperation allowed it to be gifted to the citizens of the Town by Henry VIII through the agency of a local notable, Bishop Vesey, who was one of Henry’s Lord Chancellors. The proximity of the Town Gate site to a centre of population meant that it was never likely to suffice for long, although it must be noted that a game was played on as near the original course as possible as part of the Centenary celebrations in 1989. In 1890 the Club moved to its current site near the Streetly Gate of the Park. 18 holes were laid out by 1893 and a Clubhouse was built a few years later on a freehold site outside the boundaries of the Park opposite the first tee. A crucial time for this Club, as for most other Clubs, was when the full impact of the First World War was experienced. The carnage of that War, carrying away so many young men, meant that the critical point of survival was approached very closely in, and after, those years. Between 1913 and 1918, the number of male club members fell from 255 to about 125 and it was in that context that the Committee of the day demonstrated a degree of courage, surely envied by its successors, in approaching Dr. MacKenzie of Leeds to revise the course to enhance its popularity. Dr MacKenzie has subsequently become one of the most celebrated Golf Architects in the world, but at the end of the War he was only beginning to emerge in the profession. MacKenzie first visited the Club in 1919 and, showing no few qualities as a salesman at least, observed "The land on which the present course is situated is almost the best heathland I know for golf ... if the suggested alterations are done ... there is no reason why it should not compare favourably with the best inland course in Britain, and be vastly superior to many seaside ones". MacKenzie’s plans were adopted after several modifications but the project did not proceed quickly due largely to a serious grass fire in 1921. The fire burnt deeply into the peat in places and this contributed to a crippling financial debt only being avoided through the generous efforts of the members. Incidentally the total refurbishment of a bunker in 2015 uncovered a layer of ash that had lain undisturbed since that fire 94 years before. MacKenzie’s revised course opened finally in September 1934 and while many tees have been extended and supplemented by others and some bunkers have been changed, much of MacKenzie’s work has survived. The Club has hosted many prestigious events during its existence. However the Centenary in 1989 gave the Club the opportunity to celebrate its existence, and celebrate it did, in style! Among the many events held was a Pro-Am that attracted Vijay Singh, Sam Torrance, Laura Davies, Manuel Pinero, Jose Rivero, Jose-Maria Canizares and many others. Away from all the ‘sound and fury’ it is the fair, but frequently stern test that the course presents in idyllic surroundings that continues to attract real golfers to become members of the Club. The roman road, Icknield Street crosses the course on its way to join Watling Street at what is now called the village of Wall. The past and the present envelop this course both on a bright spring morning and on a drowsy summer’s evening.